Although she grew up in poverty and willingly embraced it in her vocation, Crescentia had a good head for business. Under her able administration, her convent regained financial stability. Too often we think of good money management as, at best, a less-than-holy gift. But Crescentia was wise enough to balance her worldly skills with such acumen in spiritual matters that heads of State and Church both sought her advice. Crescentia was born in 1682 in a little town near Augsburg, the daughter of a poor weaver. She spent play time praying in the parish church, assisted those even poorer than herself and had so mastered the truths of her religion that she was permitted to make her holy Communion at the then unusually early age of seven. In the town she was called "the little angel." As she grew older she desired to enter the convent of the Tertiaries of St. Francis. But the convent was poor and, because Crescentia had no dowry, the superiors refused her admission. Her case was then pleaded by the Protestant mayor of the town to whom the convent owed a favor. The community felt it was forced into receiving her, and her new life was made miserable. She was considered a burden and assigned nothing other than menial tasks. Even her cheerful spirit was misinterpreted as flattery or hypocrisy. Conditions improved four years later when a new superior was elected who realized her virtue. Crescentia herself was appointed mistress of novices. She so won the love and respect of the sisters that, upon the death of the superior, Crescentia herself was unanimously elected to that position. 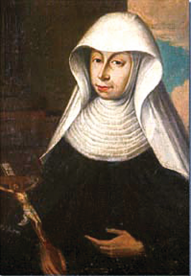 Under her the financial state of the convent improved and her reputation in spiritual matters spread. She was soon being consulted by princes and princesses as well as by bishops and cardinals seeking her advice. And yet, a true daughter of Francis, she remained ever humble. Bodily afflictions and pain were always with her. First it was headaches and toothaches. Then she lost the ability to walk, her hands and feet gradually becoming so crippled that her body curled up into a fetal position. In the spirit of Francis she cried out, "Oh, you bodily members, praise God that he has given you the capacity to suffer." Despite her sufferings she was filled with peace and joy as she died on Easter Sunday in 1744. She was beatified in 1900 and canonized by Pope John Paul II in 2001.